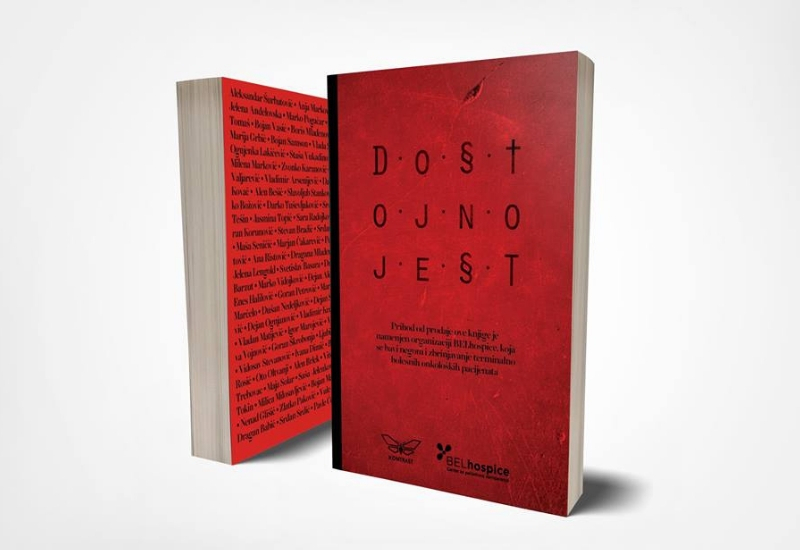 The book published by Contrast (Kontrast) publishing house called “It’s Dignified” (“Dostojno jest”) is an anthology of poetry and prose, and the pruchase of this book supports the care of terminally ill persons with cancer, which is done by the center for palliative care BELhospice. The book launch will be held at the Culure Center Grad (Kulturni centar Grad), on Wednsesday, 3rd October, starting at 20h. Visitors will be able to purcahse a copy of the book at the price of about EUR 6 (RSD 699). This publisher starated this exceptional initiative hoping to raise public awareness on palliative care and its importance to oncological patients in progressive phases as well as their families. The work of centers such as that run by BELhospice is extremely valuable, since once terminal status has been determined, patients are cared for at home, where families are often not able to provide care during the entire day which their loved ones need. Especially significant is the professional psychological support which is provided at the centers of this kind. Along with its important cause, this collection also has a significant literary value, as several of the biggest local writers of today donated their works for the book. The publication includes, among others, works by Svetislav Basara, Ivana Dimić, Vladimir Arsenijević and Vladimir Kecmanović. The works are thematically diverse, as there was no set topic and the writers were free to choose their own poems, short stories or excerpts from novels. The books can be purchased in several bookstores across the country, as well as Contrast website. And if you purchase your copy through the published you can be sure that the entire price of the book will be given to BELhospice. Come to the book launch, for a great addition to your library and a chance to support BLELhospice!